Metro Kajang's executive chairman Datuk Alex Chen expects contribution from plantation to exceed 30 per cent from 2013 onwards, instead of zero now. PROPERTY developer Metro Kajang Holdings Bhd is beefing up its plantation business so it could account for a fifth of its earnings in 2012, its chief said. Metro Kajang ventured into plantation in 2007 when palm oil prices were on the rise. It bought 95 per cent of PT Khaleda Agroprima Malindo Plantation and is involved in the cultivation of oil palms and production of crude palm oil. PT Khaleda owns 15,942ha of plantation land in east Kalimantan and 94 per cent has been planted as at February this year. Executive chairman Datuk Alex Chen said he expects contribution from plantation to exceed 30 per cent from 2013 onwards, instead of zero now. Currently, a bulk of the company's earnings come from property development. The rest is from property investment, integrated livestock processing, manufacturing and trading of building materials. Chen said the fresh fruit bunch (FFB) output is targeted at above 10 tonnes per hectare in the first year, and 30 tonnes per hectare upon full maturity in five to six years. Metro Kajang is spending RM42 million to set up a 60-tonnes a day mill near the plantation by this September. It will upgrade the mill to produce 90 tonnes daily by 2013 for some RM15 million more, he said. 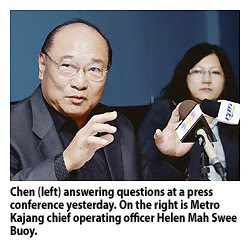 Chen said going forward, Metro Kajang will focus on plantation and property development. "We may raise capital through borrowings or a corporate exercise to buy land for our property and plantation divisions when the need arises. "Plantation is a rising jewel for Metro Kajang. We are very ambitious for growth but will be cautious in any investment that we make," Chen said. At a media briefing yesterday in Kajang, Selangor, Chen said it is looking to buy 20,000ha of plantation land from a local land owner in East Kalimantan for an undisclosed amount. Chen, who is not new to plantation, having been in the business some 20 years ago, said Metro Kajang may buy rivals or merge with other plantation firms when the opportunity arises. On property development, the company has RM3 billion worth of properties in its bag, which it is launching in phases until 2015. The properties, comprising high-end landed residential and high-rise apartments as well as shops, are located in Kajang, Semenyih, Desa Melawati and Bangsar. Will an MRT affect the price of your properties?